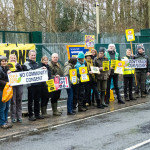 Local campaigners and supporters from Surrey and Sussex gathered at Horse Hill this morning as part of the national #NoFrackingWay campaign. Horse Hill Developments Ltd is about so start testing oil flows at the well they drilled here in 2014. Depending on what they find, they may seek to use fracking or other unconventional extraction methods. Horse Hill Developments Limited is expected to start flow testing at Horse Hill within the next couple of weeks. What’s flow testing? It means they will be testing the potential flow of oil from three layers underground: the Portland Sandstone and the Upper Kimmeridge Limestone and Lower Kimmeridge Limestone. We understand that the Portland sandstone can yield conventional oil, and the Kimmeridge limestone would require fracking or other unconventional methods to extract it. 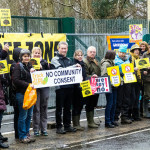 Frack Free Surrey is opposed to both conventional and unconventional extraction of oil and gas. Quite apart from the local impacts, including the threat of air and water pollution, traffic and industrialisation of this peaceful area, to avoid hitting a catastrophic climate tipping point, we need to keep 80% of all known fossil fuels in the ground. 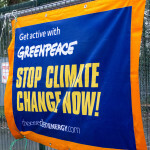 The Paris Climate Conference in Decemeber confirmed the urgency of shifting away from fossil fuels. Instead of drilling more out of the ground, we should be investing in genuinely low- or zero-carbon energy technologies such as tidal, wind and solar. 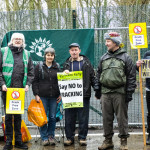 This Sunday, 31 January, is No Fracking Way, a national day of action. Right across the country people will be gathering to call for an end to fracking and extreme oil and gas extraction, and for a clean energy future. In Surrey we will be at the Horse Hill drill site on Horse Hill, Horley, Surrey, RH6 0HN, from 10am. We’ll be adding our voices to the collective call to #StopFracking in the UK. This will be an entirely peaceful, good-humoured and welcoming get-together. Please come, and bring banners, flasks and most importantly… BISCUITS! 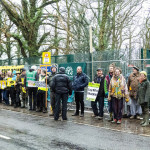 Flow testing is about to begin at Horse Hill Drilling Site and this is a good opportunity for the people of Surrey to show that we are opposed to this unnecessary drilling that threatens our water, our air, and our communities! Flow testing at the Horse Hill site near Horley could get under way in a matter of weeks. The Proactive Investors website reports that the project has received clearance from the Oil & Gas Authority. And it quotes Solo Oil Chairman Neil Ritson, who says key equipment will be mobilised in the coming weeks. Ritson says that Solo’s primary interest is in the Portland layer, which can yield conventional oil, while the deeper Kimmeridge is “a longer term prospect”. The deeper play is referred to as ‘tight’, which means it may require fracking or other unconventional methods to extract it. 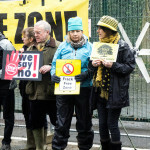 Frack Free Surrey is opposed to both conventional and unconventional extraction of oil and gas. Scientists say that to avoid hitting a catastrophic climate tipping point, we need to keep 80% of all known fossil fuels in the ground.